The new Potain MDT City crane. Potain, a leading brand within the Manitowoc umbrella, has expanded its MDT City series, with crane models that are described as being the best within the comprehensive range. The new range includes the MDT 109, MDT 139, MDT 189 and MDT 219, all evolutions of previous MDT City cranes, ranging from 55 to 65 m, and hoisting capacities from 6 to 10 tonnes. 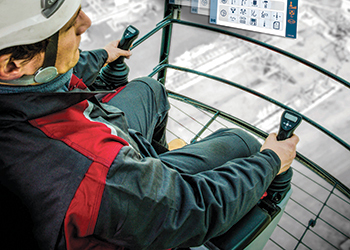 They feature Manitowoc’s latest Crane Control System (CCS). 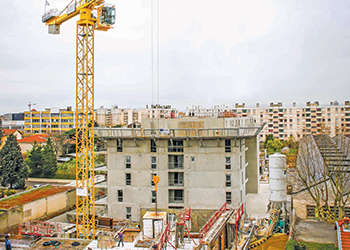 “We are at the forefront of tower crane development and our control system will demonstrate this,” says Jean-Noel Daguin, senior vice-president of Potain tower cranes. The new Potain MDT City Ultraview Cab. The MDT CCS City cranes allow complex multi-crane installations by considerably reducing the height gaps and interference of cranes on work sites. The assembly, erection, transport and even maintenance times are reduced, helping to keep operating costs low. The new CCS City range will be available for delivery in late 2015. Elaborating on the advantages of the new control system, a spokesman for Manitowoc says: “The CCS featured on the MDT CCS City range helps to get more work done faster, and with great precision. The user-friendly crane control system will be progressively installed on all new Potain tower cranes, achieving the highest level of comfort, ergonomic control, and lifting capacity. 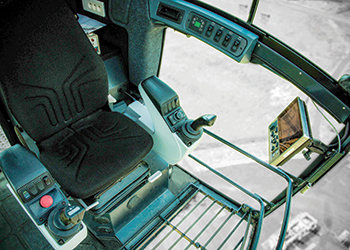 Potain’s premium Ultraview Cab, now equipped with the CCS, enhances driver ergonomics and comfort and provides more precise crane control. The new Potain Plus function facilitates driver versatility and productivity, offering precision control and increased load curves. In the Potain Plus mode, CCS limits dynamic effects by automatically adapting speed and acceleration to further optimise the load curve, says the spokesman. “With the new CCS, Potain tower cranes will meet or exceed applicable European safety standards. The system monitors itself in real time, ensuring proper operation of the crane, and a seat sensor prevents the crane from being operated unless the operator is present,” he adds. The cab ... enhanced driver ergonomics. All Potain MDT, MD and MR range cranes use the same cab and control systems, making them easier to commission, operate and maintain, saving time and resources, as well as simplifying training for operators and technicians. The standardised cab and sensors allow for improved efficiencies in spare parts. An integrated diagnostics tool offers easy monitoring of the crane settings, operations and service maintenance, saving costs and reducing downtime. The system also features a remote function, CraneStar Diag, allowing technicians to monitor the crane at a distance in real time. Founded in 1902, the Manitowoc Company is a multi-industry, capital goods manufacturer with 92 manufacturing, distribution, and service facilities in 25 countries. The company is recognised globally as one of the premier innovators and providers of crawler cranes, tower cranes, and mobile cranes for the heavy construction industry. In 2014, Manitowoc’s revenues totalled $3.9 billion, with approximately half of these revenues generated outside of the US.